Recognition for Libris is based on superior customer satisfaction ratings. 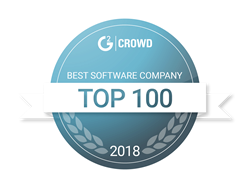 G2 Crowd ranked Libris in three major categories altogether, including Top 100 Software Companies, Top 50 Mid-Market Software Companies, and Top 25 B2B New York City Tech Companies. Across 203 verified real-user reviews in the Digital Asset Management category, Libris received a 4.3 out of 5 star user satisfaction score. Users pointed to Libris’ optimization of images (95%), performance and reliability (91%) and metadata (90%) as three top-rated features. The state of New York City tech report recognizes Libris by PhotoShelter, alongside 24 NYC SaaS and service companies, as a leader of the city’s tech scene. Overall, the report covers over 80 companies across the city. Read the entire report to see the trends and how Libris by PhotoShelter is contributing to the overall state of the B2B New York tech scene. In Fall 2017, Libris was also named a Leader in the Digital Asset Management Grid Report from G2 Crowd. Libris (libris.photoshelter.com) is the simplest and fastest digital asset management platform built for visual media. With Libris, you have easy access to photos and videos so you can engage your audience anytime, anywhere. Our platform gives your team control and flexibility so everyone can upload, organize and share assets in a way that works for them. We have over 12 years of experience managing half a billion assets, and we’re trusted by hundreds of brands across industries. Libris powers your brand's visual storytelling. G2 Crowd, the world’s leading business solution review platform, leverages more than 310,000 user reviews to drive better purchasing decisions. Business professionals, buyers, investors, and analysts use the site to compare and select the best software and services based on peer reviews and synthesized social data. Every month, nearly one million people visit G2 Crowd’s site to gain unique insights. G2 Crowd aims to bring authenticity and transparency to the business marketplace. For more information, go to G2Crowd.com.